Choose from 4 durable thermofused melamine cabinet finishes; Red Alder, Natural Maple, White Maple and White. 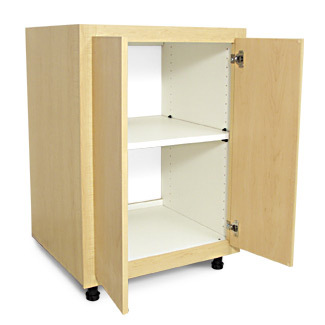 >>Note: Adjustable cabinet feet add an additional 3.5" to 6" overall cabinet height. Note: Slide-Lok does not recommend the use of stackable cabinets as wall cabinets without support cabinets below, especially in the 24" depth. The weight of the items loaded in the front of the 24" cabinet can cause it to come off the wall. Slide the top and bottom panels into place on the cabinet's face frame. Slide the right side panel into place lining up the dovetail joints with the top and bottom panels. Slide the nailers or wall brackets on to the back of the top and bottom panels by lining up the dovetail joints. Slide the left side panel into place as you did with the right panel, lining up the dovetail joints with all panels. Attach the plastic adjustable legs and set to desired height. Attach the doors and adjust using the built in adjustment features of the hinges until level. Finally, install the adjustable shelf.